I am beyond thrilled to learn that New Lines: Critical GIS and the Trouble of the Map is now in print. 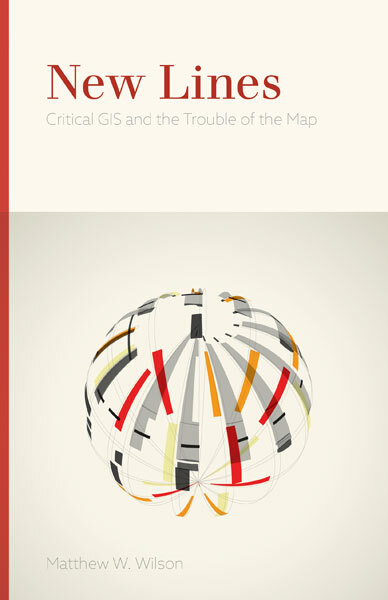 This book is my attempt to re-examine the practice of mapmaking, amidst the troubles that the map presents. The abstract and endorsements of the text, now available from University of Minnesota Press, follows. 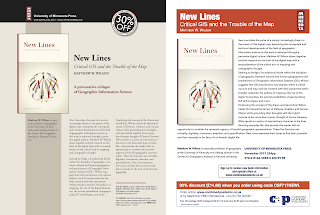 You can also receive 30% off when you order at www.upress.umn.edu, using discount code MN81730. Offer expires Jan. 1, 2018. "With rapidly shifting digital technologies, geo-surveillance, everyday cartography, privatized georeferenced data, and neoliberalization, New Lines offers a reflexive reassessment of the scholarly praxis of critical GIS, an increasingly anachronistic term. Attentive also to contemporary philosophical debates, Matthew W. Wilson’s lively and ambitious manifesto pushes the reader to re-examine everything they thought they knew about the topic." "This elegantly argued book offers a brilliantly original perspective on the many ‘troubles’—technical, epistemological, cultural, and political—associated with the contemporary proliferation of digital mapping systems. 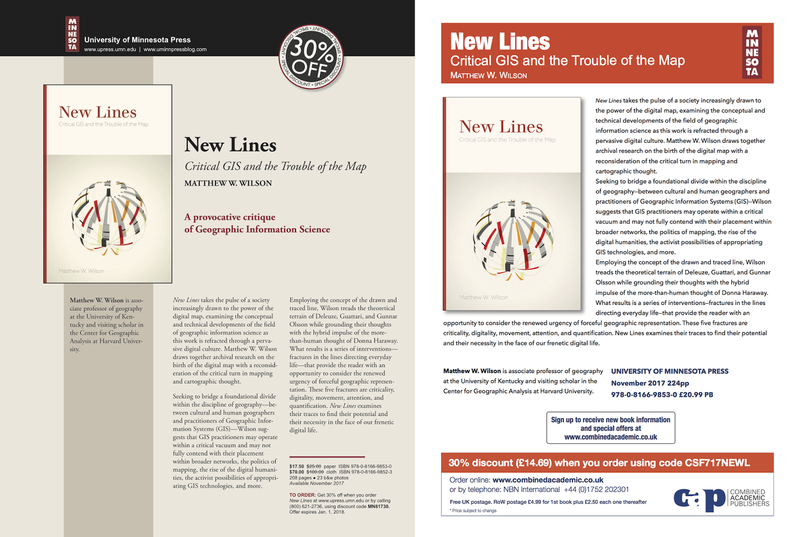 For anyone interested in understanding the rapidly changing sociohistorical, technological and institutional contexts in which cartographic practice occurs, Matthew W. Wilson’s New Lines will provide a foundational source of insight, wisdom, inspiration, and provocation." New Lines takes the pulse of a society increasingly drawn to the power of the digital map, examining the conceptual and technical developments of the field of geographic information science as this work is refracted through a pervasive digital culture. Matthew W. Wilson draws together archival research on the birth of the digital map with a reconsideration of the critical turn in mapping and cartographic thought. Seeking to bridge a foundational divide within the discipline of geography—between cultural and human geographers and practitioners of Geographic Information Systems (GIS)—Wilson suggests that GIS practitioners may operate within a critical vacuum and may not fully contend with their placement within broader networks, the politics of mapping, the rise of the digital humanities, the activist possibilities of appropriating GIS technologies, and more. Employing the concept of the drawn and traced line, Wilson treads the theoretical terrain of Deleuze, Guattari, and Gunnar Olsson while grounding their thoughts with the hybrid impulse of the more-than-human thought of Donna Haraway. What results is a series of interventions—fractures in the lines directing everyday life—that provide the reader with an opportunity to consider the renewed urgency of forceful geographic representation. These five fractures are criticality, digitality, movement, attention, and quantification. New Lines examines their traces to find their potential and their necessity in the face of our frenetic digital life.